The title of this post is the same as that of this article on the Southern Reporter. If you live near or use the Borders Railway, I suggest you read the article. Alex Hynes, who is Managing Director of ScotRail has promised. Three-car Class 170 trains will replace the current two-car trains. More drivers will be trained. Extra stops including at Stow will be added to services. In 2015, in the Peak, there were 850 seats out of Edinburgh. After the new trains are introduced, there will be 1,400. He also said that things would happen in months not years. This is a paragraph from the article, as spoken by Alex Hynes. The three-carriage Class 170 trains accelerate and brake more quickly that the current two-carriage trains. That means we can put a stop at Stow in all the time without it affecting our performance, but to do that we need Class 170 trains on the route all the time and to be able to make sure that stop doesn’t affect our service performance. It’s a good explanation of why you need fast trains on stopping services. There is also something that is worth noting about the Class 170 trains. Currently, they are diesel trains with a hydraulic transmission. But Porterbrook, who are the leasing company, who actually own the trains, are planning to test a new diesel-electric hybrid system in 2020, that will increase the performance of the trains, in terms of speed, acceleration, noise and emission. I wrote about this important upgrade in Rolls-Royce And Porterbrook Launch First Hybrid Rail Project In The UK With MTU Hybrid PowerPacks. I will be watching this development with interest, as if it is successful, passengers, residents, train companies and staff will benefit. Should The Borders Railway Be Extended To Carlisle Before The Opening Of High Speed Two? The UK and Governments seem to be moving on extending the Borders Railway. This article on the BBC is entitled Borders Railway Extension Study Supported. The promoters of High Speed Two have insisted that the High Speed Rail Line, is a line for all the UK. High Speed Two will have one train per hour between London and Glasgow, which will use the West Coast Main Line, to the North of Crewe. This page on The Guardian is entitled How Will HS2 Change Journey Times To And From London? The current time between Euston and Preston is two hours and eight minutes, which High Speed Two will reduce to one hour and twenty-four minutes. Currently, the fastest trains between Preston and Carlisle take an hour and five minutes, so Carlisle is reached in three and a quarter hours. I think it is a reasonable assumption to make that when High peed Two opens, Carlisle could be reached in two and a half hours, either direct or with a change at Preston. At the present time, the maximum speed on the West Coast Main Line, which is used by all trains between Preston, Carlisle and Glasgow is 125 mph. But Virgin’s Class 390 trains could run at 140 mph with digital in-cab signalling. This improvement could reduce the time between Preston and Carlisle to an hour. It is likely that before High Speed Two opens to Crewe in 2027, the Class 390 trains will be replaced. As the West Coast Main Line and High Speed Two, will have the same operator, It would surely be sensible to replace the Pendolinos, with the High Speed Two classic-compatible rolling stock. This is said in Wikipedia about High Speed Two rolling stock. Alstom, one of the bidders for the contract to build the trains, proposed in October 2016 tilting HS2 trains to run on HS2 and classic tracks to increase overall speeds when running on classic tracks. A single class of trains on High Speed Two handling all services. Classic services on the West Coast Main Line using High Speed Two rolling stock. One type of train, must be more economic to operate. There would be timing improvements on West Coast Main Line services, due to the faster trains running under digital signalling. Trains could be introduced on West Coast Main Line services first. , The trains might cost more, as Wikipedia points out. But this will be a very large and important order for whoever wins the contract to build trains for High Speed Two and the West Coast Main Line! So expect the bidders to submit some very innovative solutions for these trains! No-one would change the fleet on the West Coast Main Line for a new fleet of faster trains, without doing the following. Removing some or all of the known problems with junctions and stations on the route. Installing digital signalling on the whole route and all trains. Introducing 100 mph freight locomotives and trains. What would happen to timings to Carlisle? I think the following would not be impossible, with new trains, digital signalling and selective route improvements. London and Carlisle in three hours using the West Coast Main Line. London and Carlisle in two hours using the High Speed Two to Crewe and then the West Coast Main Line. Considering, that these trains could probably go between Carlisle and Glasgow in an hour, there could be some impressive times to Glasgow. As I said in the previous section, there will be a lot of improvement in the times between London and Carlisle in the next few years, with times possibly dropping to around two hours in 2027, when High Speed Two opens to Crewe. Before 2027, it looks like there will be a steady reduction in journey times between London and Carlisle. This will mean that increasingly the residents of the Borders will go to Carlisle, when they want to go South. So I come to the conclusion, that it is absolutely essential, that the Borders Railway be extended to Carlisle as soon as is possible. To make best use of the new trains between Carlisle and Glasgow, there will probably be improvements to the West Coast Main Line through and to the North of the City. The old MOD Depot at Longtown has been proposed as a new freight depot and this too will also require improvements, to the West Coast Main Line. As the rebuilt Borders Railway will join the West Coast Main Line in the Longtown area, it looks to me, that a proper plan, would incorporate the Borders Railway connection in the West Coast Main Line improvements, that probably must be done. High Speed Two will turn Carlisle into an important rail hub with links all over the Borderlands. I believe it is essential that the Borders Railway should be extended to Carlisle as soon as possible and certainly before 2027. With good planning, the Southern section could even be done as part of West Coast Main Line improvements for High Speed Two. This report on the Scottish Government web site is entitled Borders Transport Corridors – Pre-Appraisal. It is a comprehensive report with a helpful pag of recommendations. Recommendations that apply to rail include. This seems sensible, as some of the forests on both sides of the Scottish order are mature and need to be cut down and replanted. Every part of the UK seems to need more Park-and-Ride. The Borders is no exception. Will it go all the way to Carlisle? The West Coast Main Line will need a capacity increase through Carlisle because of High Speed Two. These works could be combined with those on the Southern part of the Borders Railway. Plans exist for a large freight interchange at Longtown on the former MoD site. Linking the Tourist areas North and South of the Scottish Border by rail must be a good thing. Extension to Carlisle would give those in the Scottish Borders access to High Speed Two at Carlisle, without a long trip via Glasgow. For these reasons, I think that the Borders Railway will go to Carlisle. This surprised me, but it does complete the jigsaw. Does it offer a freight route for moving the timber out of the area? It woulde certainly offer a scenic route between Edinburgh and Newcastle. This is surely building on the success of the current Borders Railway. Link Borders Railway and Fife Circle, providing interchange at Edinburgh Gateway; West Edinburgh; and potential future link to Glasgow. The Borders Railway and Fife Circle are both half-hourly services, so could be connected together, once suitable rolling stock is available. This service would also connect the Borders to the Edinburgh Airport tram at Edinburgh Gateway. With extra services, would the capacity of the Borders Railway will probably need to be increased? Does the South East extension enable better services for the Borders beyond Edinburgh? There are a lot of projects needing to be developed, but they will create a lot of economic activity in the Borders. The two railway extensions to Hawick and/or Carlisle and Berwick-on-Tweed are the two most expensive projects, but both have English implications, so I don’t think Westminster will mind paying some of the cost. This is an important extension, as it unlocks a valuable housing site at Barking Riverside, where 10,800 homes will be built. It is going to cost £263million, which works out at £24,000 for each house and flat. By comparison, the billion pound Northern Line Extension to Battersea will serve around 50,000 houses, or £20,000 for each. And the Lea Valley Rail Programme is a £170million project, that will serve 10,000 homes at Meridian Water with a new Meridian Water station. This is slightly cheaper at £17,000 per home, but a double-track railway was already in place. Note that in all these schemes, the developers have made contributions. Some have been larger than others. There are a surprisingly close set of figures for cost per home, considering that the developments will probably be at different points on the luxury spectrum. So if we are building a large housing development in London, of say 10,000 homes, should we be prepared to spend around £200million on providing decent rail or some other fast and accessible public transport access? At the smaller end, if say a developer is building five hundred new homes, this could mean it is worth spending up to ten million on updating an existing station. The new Lea Bridge station seems to have cost around this sum and seems to be supporting hundreds of homes. So how does this figure fit in with proposed developments in London? Brent Cross Cricklewood is described like this in Wikipedia. Construction was planned to start in 2018 and be completed in 2021-22, but in March 2018 a delay was announced to January 2019. It will be served by a new Brent Cross West station. This site will be redeveloped with 3,500 homes, according to documents on the Internet. It also sits beside the Great Western Main Line and Crossrail, but no station is currently planned. But applying the the formula, should mean that on a site like this, £70million should be available for public transport developments. The Southall Gas Works site has planning permission for 3,750 homes. The site is close to Southall station, which will be on Crossrail. Plans exist to update Southall station, but the plans look very inadequate. In my view this site would e ideal for a driverless shuttle that took residents and visitors too and from the station. My knowledge of the country outside of London is not so good, but some new stations have been built to support new housing and other developments. It certainly seems, that in the UK, we’re building stations and new lines to improve the accessibility of developments. I feel it would be a good idea for the England-Scotland border to get a growth deal, as every time I go there, it seems to me that the Borderlands are economically interdependent. Among the schemes potentially involved is a study looking at extending the Borders Railway to Carlisle. This railway would surely be very beneficial in industries like tourism and forestry. There are a lot of stone arch railway bridges in the UK, but they do seem to more numerous in Scotland, than in England. These pictures show a selection of bridges on the Borders Railway. 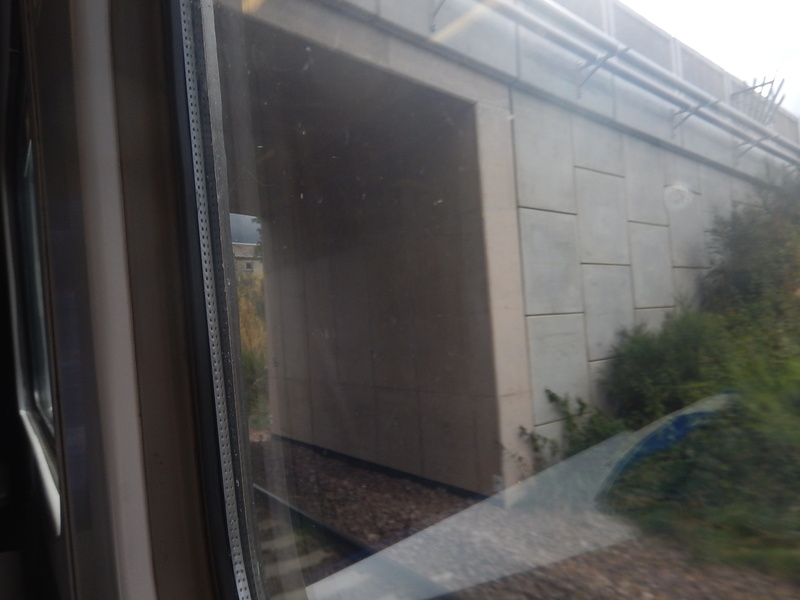 I counted to about fifteen between Edinburgh Waverley and Galashiels stations. There were probably about an equal number of bridges where a stone arch bridge had been replaced by a modern concrete structure, like this one. They’ll probably last a thousand years, but they lack the charm of the stone arch bridges. These pictures show a selection of bridges on the Busby Railway between Glasgow Central and East Kilbride stations. These pictures show a selection of the many bridges between Aberdeen and Montrose stations on the Edinburgh – Aberdeen Line. I took pictures of at least twenty. Freight trains, especially those with the larger containers need a loading gauge, that is big enough to accept them. The loading gauge in the UK, is summed up by these two sentences from Wikipedia. Great Britain has (in general) the most restrictive loading gauge (relative to track gauge) in the world. This is a legacy of the British railway network being the world’s oldest, and having been built by a plethora of different private companies, each with different standards for the width and height of trains. These are the commonest gauges. W10: Allows 2.9 m (9 ft 6 in) high Hi-Cube shipping containers to be carried on standard wagons and also allows 2.5 m (8 ft 2 in) wide Euro shipping containers. W12: Slightly wider than W10 at 2.6 m (8 ft 6 in) to accommodate refrigerated containers. The Borders Railway appears to have been built to at least W8, so it could handle standard freight containers. But the line doesn’t carry freight! On the other hand, I suspect the following were considered, when designing the Borders Railway. Network Rail and rail maintenance companies, may need to bring some large rail-mounted equipment along the line for regular or emergency maintenance. If the line is extended to Carlisle, the route could be used as a diversion for freight trains, if the West Coast Main Line is closed, due to weather or engineering works. There may be a need to use the Borders Railway to extract timber from the forests of the Borders. The need for freight on the Borders Railway, explains why there are so many new overbridges. Electrification with overhead wires needs extra clearance. It looks to me, that the Borders Railway has been given enough clearance for future electrification. Electrification under the Edinburgh to Glasgow Improvement Program (EGIP), proved to be difficult. It wasn’t helped by the standards changing half-way through the project and the numerous bridges and tunnels that had to be rebuilt. An important route like Edinburgh to Glasgow probably needs to be fully-electrified, but the difficulties encountered and those in Lancashire have encouraged Network Rail and the engineering consultants to look at other methods of electrifying lines in the UK. I doubt this will ever happen in a conventional manner. Would electrification of the Forth Bridge and Tay Rail Bridge be allowed? The disruption of rebuilding the stone bridges would be enormous. The line only has a maximum speed of 100 mph. Diesel and alternative power sources like hydrogen will be able to maintain the fastest speeds, that are possible on the line. Money would probably give better value, if it were to be used to increase line speed. This article on Rail Technology Magazine is entitled Network Rail Electrification Plans Stalled After Council Rejects Bridge Removal Bid. Campaigners are celebrating after plans from Network Rail to demolish a bridge as part of its electrification scheme were rejected by a local council. The bridge in question is a Grade II listed overbridge at Steventon in Oxfordshire. It is not unlike those in Scotland, that are shown in my pictures. In the 1960s, British Rail would have just blown it up and replaced it with a concrete monstrosity. I am not advocating a return to this policy, but Network Rail has a problem at Steventon, that they need to fully electrify the line, if electric trains are to use the route on electric power, rather than using environmentally-unfriendly diesel power. Since the new Class 800 trains for the route were designed and ordered, the technology has moved on. In South Wales, discontinuous electrification and trains with a battery capability will be used. Scotland and other parts of the UK, like the Pennines and in the valleys of South Wales, have a serious problem with the way the Victorians built our railways. \development of the UK rail network with electrification and an enhanced freight capability needs to be thought out carefully and with great ingenuity. Financial Trouble At TfL: Can It Stay Afloat? The title of this post, is the same as that of this article on Railway Technology. London’s public transport provider, TfL, is under increasing pressure. Not only has its government operating grant been slashed but a funding freeze is also expected to cost £640m across the course of the current mayoralty. Can TfL create the commercial income needed to keep it afloat or are there serious causes for concern? The government is cutting subsidy to TfL, but Sadiq Khan knew that when he stood for Mayor. So what did he do? He offered a fare freeze until 2020. It looks like more fantasy Socialist accounting to me, to ensure victory in an election. The article also says this about the future. If these predictions are wrong, TfL will be in trouble. For myself, I suspect that Crossrail will suffer with its own version of London Overground Syndrome, with passenger numbers much higher than predicted. In The Scottish Borders Have Caught London Overground Syndrome, I talked about an outbreak in the Scottish Borders, after the opening of the Borders Railway, and said this. This disease, which is probably a modern version of the Victorian railway mania, was first identified in East London in 2011, when it was found that the newly-refurbished East London Line and North London Line were inadequate due to high passenger satisfaction and much increased usage. It has now spread across other parts of the capital, despite various eradication programs. But for the Mayor to rely on that, is clutching at straws. The title of this post, is the same as that of this article in the Southern Reporter. My feeling is that I don’t think the MP should worry about this one. When High Speed 2 opens to Crewe in 2027, London to Glasgow trains will take under four hours. The West Coast Main Line will be improved between Carlisle and Glasgow. Freight traffic between England and Scotland is increasing. A large freight interchange could be built at Longtown. Increased services between Liverpool/Manchester and Edinburgh/Glasgow are starting. Carlisle station is being refurbished. All this will lead to more through traffic at Carlisle. I would think it would be extremely likely, that the West Coast Main Line between Carlisle and Longtown will be improved substantially. If this happens, then any extension of the Borders Railway will have a fast link to HS2 at Carlisle, from where it will probably join the West Coast Main Line in the Longtown area. It should also be noted, that High Speed 2 is being designed to give benefits to as many places as possible. A Borders Railway connected to Carlisle fits this strategy.